Here's the inspiration, folks. Isn't it a gem? 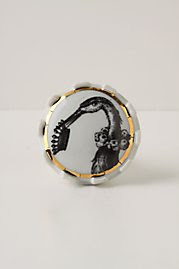 I love this little knob from Anthropologie. But, the $12 a knob didn't exactly fit into my budget. I bought a dresser this summer for $20 that I have been waiting to ravamp for Lady "P," but I have not found the whimsy and color I've been looking for in a knob. But, then I stumbled upon these anthro knobs and fell in love. So, what was I do to? Attempt a copy. I'm still searching for a nice bird print. But, I did find a floral paper at the scrapbook store. If any of you know of a black and white bird print, puh-lease steer me in that direction. 1. Paint the knobs to the color of your choice. I did mine white. No worries about getting the surface perfect, it's going to be covered with paper anyway. 2. Paint the surface of the knob with a layer of modpodge glue. Let it get a little tacky. The paper will stick better if you let it sit for a sec before slapping the paper on. 3. Lay a square of paper onto the surface of the knob and pull tightly down. 4. You can use a bone folder for this step if you have one. Buster "J" has triangular-shaped Melissa and Doug colored pencils. So, I just used the flat edge of one of those. Rub it across the surface, smoothing out the paper and adhering it to the knob. 5. Let the glue sit for a few hours so it's nice and stiff. Using sandpaper or a modpodge sanding brick, start sanding around the edge, removing the excess paper. 6. Paint a layer of modpodge glue over the surface of the knob. For added durability, continue adding multiple layers of the glue. Ta-da! Done. Can't wait to find a home for these beauties. Cute! I always wondered how to get the edges of my modpodged stuff smooth! I guess I need a modpodge sanding brick! These are great! Thanks for the great tutorial!